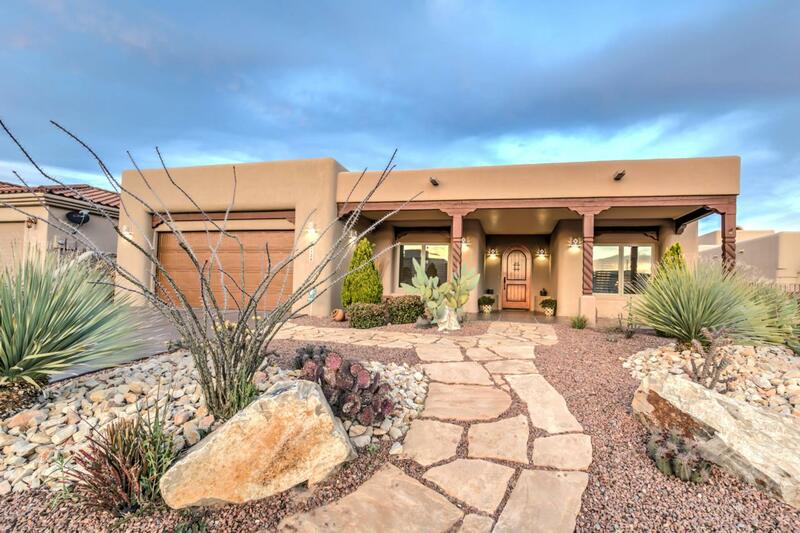 Stunning, southwest style, custom built home! The beautifully manicured front & back yard is to be admired, but wait, prepare to be enveloped by the warmth, beauty and flow of this home. Ornate details are displayed in the hand carved posts, custom shutters and Kowalski cabinets. High ceilings impress upon you as you enter and catch a glimpse of the Organ Mountain Views. The kitchen has an abundance of cabinets with pull-out drawers, stainless steel appliances, to include a warming drawer, and a beautiful dry bar area in the dining area. Not only is the kitchen a great place to congregate, but there's a great outside built-in grill to enjoy in the covered back patio while cozying up by the roaring fire pit. The office/study room is a cozy area with built-in shelves & media center. 3 bedrooms & an office! This home also has a 3 car TANDEM garage with a built-in workshop and a few other surprises. This home has too may wonderful amenities to list and to capture its true essence. Come see for yourself!